What the Heck is Black Rice? About a month ago, one my tweet peeps recommended that I try black rice since I'm not a fan of brown rice. How does it taste? I love it. It's nothing like jasmine rice (which is more fluffy) but I enjoy the nutty taste. The boys gave it a major *side eye* when they first saw it (lol) but said it tastes like regular rice after trying it. Is it expensive? It's about $4/lb at my grocery store but the boxed version (I haven't seen it yet) may be less expensive. What do you serve it with? 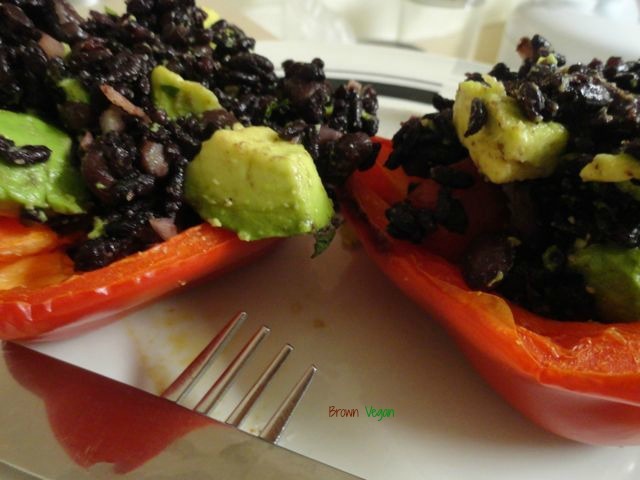 I stuffed red bell peppers with the rice, avocado, black beans, onion, garlic and cilantro. So good! I also made a tomato & basil tofu meal using the rice and pretty much use it like regular rice in recipes. I didn't measure the ingredients and got the idea to make it from my tweet bud. Have you tried black rice? What do you think?